An earthy offering from Blue Pearl, Majmua incense invokes the the pastoral notes of freshly cut hay with a touch of East Indian spice. 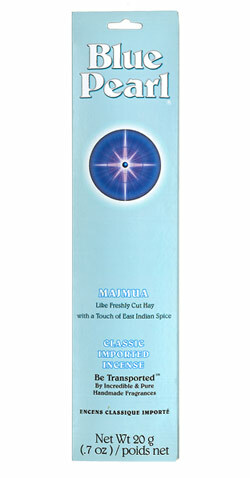 When lit with careful attention, Majumna incense will transport your body and mind. Enjoy the incredible and pure handmade fragrance of Blue Pearl Incense! Blue Pearl is the quintessence of incense. Made with the finest fragrances Mother Nature could produce, each scent imparts its own unique message with the subtle delight of each classic fragrance. Just seconds after lighting one of these delightful sticks and you can tell the difference between Blue Pearl and the inexpensive synthetic fragrances of other incense lines.